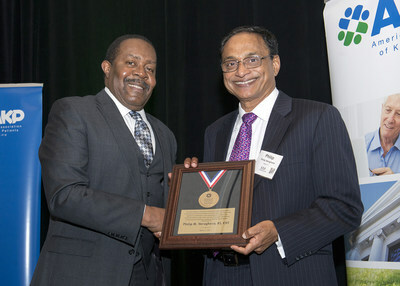 DENVER, March 21, 2017 /PRNewswire/-- DaVita Kidney Care, a division of DaVita Inc. (NYSE: DVA), a leading provider of kidney care services, today congratulates Philip Varughese, a facility administrator in Bound Brook, New Jersey, on his reception of the Medal of Excellence award from the American Association of Kidney Patients. The Medal of Excellence award celebrates individuals within the kidney and nephrology industry who have played a special role in supporting scientific progress on behalf of patients in the renal community. As the American Association of Kidney Patients' highest honor, the Medal of Excellence recipients are individuals who have tirelessly advocated for patients with chronic kidney disease and end stage renal disease. "I am very grateful to be accepting this award on behalf of all DaVita teammates, who serve our patients each and every day," said Varughese. Philip M. Varughese, BS CHT, has been a facility administrator for DaVita Kidney Care for more than 18 years. In his role, Philip oversees a team of dialysis caregivers and takes great pride in achieving optimal clinical outcomes at the units he manages. Last year under his leadership, the unit achieved a five-star ranking by Centers for Medicare and Medicaid Services. Centers for Medicare and Medicaid Services uses a five-star rating system in an attempt to better measure patient outcomes at dialysis facilities in order to give patients, their families and caregivers information they can use to easily compare dialysis centers. Early in his career, Varughese worked at the first dialysis unit ever established in India. His experience drove him to advocate for the importance of the role of the dialysis technician as an integral member of the health care team. Through DaVita's Bridge of Life program, Varughese has had the opportunity to help set up modern dialysis units to enhance the level of renal care in India. "By extending people's longevity through life-saving dialysis, we are giving patients an opportunity to live their life; to reach milestones and to see their future generations," said Varughese. "The courageous spirit of dialysis patients has taught me so much about humanity, patience and the importance of having the will to live life to its best."